It was with pleasure that I took part in World Sherry Day, a celebration to display the wonderful world of sherry and the versatility of the superb sherry wines on offer. Fortunately living in Spain I can and do frequently partake in a ‘copita’ or two, but many people often think of Sherry as the pre-lunch quaff on Sunday with their granny, well yes I did this too from a very young age, perhaps therein lies the problem ;), but there is a sherry for every dish and occasion and I was proud to showcase this at La Rosilla. 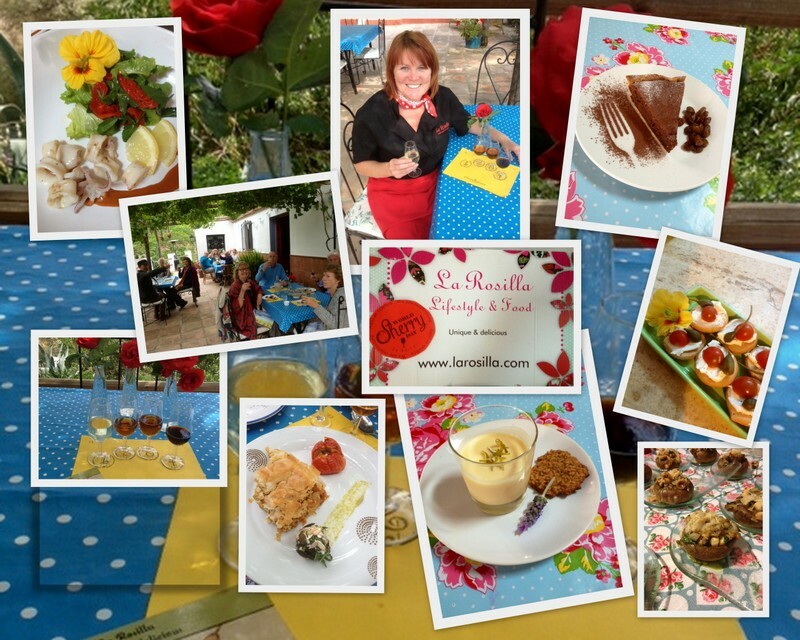 The date was perfect too for my Supper club to re-open for the summer, a celebration all round. Like normal I was living on the edge, as this years unpredictable weather was giving me the run around. As I prepped busily on Sunday morning, making everything ship shape, I did so in thick cloud and dodging rain drops…but I held out and went for it, guests arrived sensibly with shawls and jackets and with a very gung ho supportive spirit. Quarter deck cocktails, warmed everyone’s souls with canapes of Hazelnut & parmesan stuffed mushrooms, and cheese puffs with cheery toms & caper-berries. We all shared our sherry stories, and I gave a talk on the diversity of sherry, it’s origins , production and aging process, before everyone sat on the terrace ready for their feast and tastings. Lunch was served and we enjoyed, crisp dry pale gold Fino & Manzanilla, Amber rich and warm Amontillado & Oloroso, and finished with dessert and decadent luscious PX . As the sherry flowed the sun put his hat on, to end a special Sunday afternoon on the terrace.